Update as of 2014, I'm no longer creating these giant butterflies. garage for about a year waiting to get his wings and today was the day. Do you remember this recycled giant butterfly I made? It's a big one...as in a little over 5ft wide. 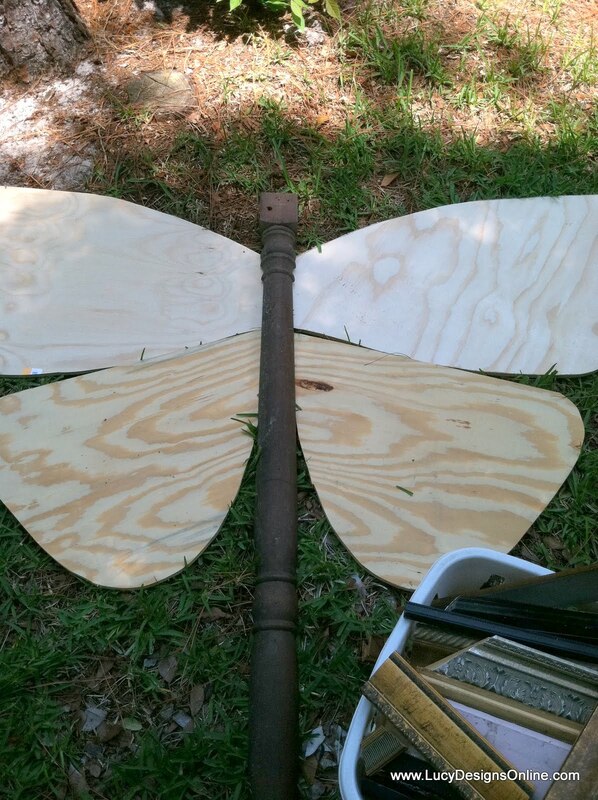 I also used shims on one of my dragonflies, they are fun and inexpensive to work with. This is how it looked before I cut the wing shape out. I cut the edges of the shims off with the jigsaw following the wing shape. at Restore for 7 bucks for the whole box. I thought I could incorporate them in the design somehow. I made a design around the edge for the caps. I hung it on my fence to get photos but it is indoor use only. This butterfly had a metamorphosis!... Check out his new look here. Love the neutral metal look for something different. The idea of the fence caps? Genius! Amazing! As always! Honestly, I am never disappointed when I come to your site! You have a true gift!